Come together and take time to breathe, bend, & bond in this playful practice for families and friends. We’ll explore yoga the easy way, including partner & group poses, acting out stories, music, yoga games, conscious breathing, and relaxation. This class is a great way for kids (ages 4 & up) and a parent or other special adult to explore yoga together in a spirit of discovery. No experience necessary. Bring a grandparent or “special grandfriend” FREE!! Space is limited – register for this month’s class. Low-cost parking and direct access from attached Kaiser garage. FREE if you exit after 9pm! Laughter Yoga is a world-wide movement for mind, body and spirit, started 20 years ago by a doctor in India. It helps us to laugh even when we don’t feel like it, using fun warm ups, playful laughter exercises, a rollicking laughter flow, and a relaxation that will leave you blissed out! No yoga mats, jokes, or even a sense of humor needed. Drop in any time – we always have newcomers. Adults and older teens of all levels of physically fitness are welcome. Wear comfortable clothing for easier laughing. I co-lead this group with group founder Annie Goglia, who started it in 2007! We trade off leading the sessions, but we both try to attend every time. I normally lead on the second Monday of the month. Laughing with others is priceless. 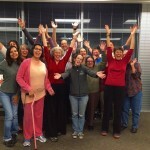 Oakland Lifefire Laughter Yoga is free; donations gratefully received. Thanks to Kaiser Permanente for donating meeting space. Among my past and present kids yoga class clients are Cottage in the Woods Preschool, Kids Speaking Spanish Preschook, Alameda Education Foundation Enrichment, and Glenview Elementary after school. I lead Laughter Yoga monthly at Center for Elders Independence in Oakland, and do special events for corporate and community clients such as Genentech, Kaiser Pinole medical staff, and the SF Jewish Community Center Seniors Program. Contact me to book a one-time or ongoing class for your group.